Sit amet 2019, consectetur adipisicing elit, sed do eiusmod tempor incididunt ut labore et dolore magna aliqua. Quis nostrud exercitation ullamco laboris nisi ut aliquip ex ea commodo consequat. Olor in reprehenderit in voluptate velit esse cillum dolore eu fugiat nulla pariatur. Sensei Ken McLean has trained in martial arts for over 50 years with the last 40 focusing on Aikido, Ki Energy Cultivation and Aiki Healing Arts. Ken’s father, was an Australian Professional Boxing Champion in 1940s-1950s (the Golden Era of Australian Boxing). From age 6, Ken accompanied his father to coaching sessions. Ken began to understand his approach: to absorb one’s opponents’ strength and energy while riding the motion of one’s partners’ attack, moving the body as one from the legs, hips and waist. After researching and training in Aiki arts, Ken realised how profound his father’s understanding and principles really were. In Ken’s early teens he trained in Judo and Aiki Jujutsu. At the age of 12, he received his first book on Aikido and Ki from a school friend, inspiring him to look more deeply into this training way. Training daily in Judo and Aiki Jujutsu, he discovered the principle of using one’s partner’s balance, winning the local judo championship. At 15, disillusioned with his life and competitive sport, Ken left school and, with friends, built a shack in the forest of the Northern NSW to seek a deeper connection with nature. They studied natural living, diet and yoga. It was here they were introduced to Macrobiotics by coming across a copy of George Oshawa’s “We are All Sanpaku” on the local tip. They immediately embraced the principles. Ken lived with his friends in the forest for over 3 years and it was at this time he developed his life-long love of great Nature (Shizen). Returning to Sydney he moved into the East West study house where he trained and studied full-time Oki-Yoga, Oriental medicine, macrobiotics, acupuncture and shiatsu. Common to these practices was the understanding of Ki (life energy). As chance would have it, up the road from the study house was an Aikido dojo run by Seichi Sugarno. Seichi Sugarno was an original apprentice to the modern father of Aikido, “O’Sensei”, Morihei Uyeshiba. Inspired by Aikido, Ken trained 6-8 hours daily in Ki and Aikido. After 3-4 years, Sugarno left Australia. Ken explored other streams of Aikido while he continued his teaching of Oki Yoga, Shiatsu and Macrobiotics. Ken moved to Melbourne for a year where he founded the Melbourne East West Center. As Ken’s own understanding of Ki deepened and developed, he began to observe that many streams of Aikido had become rough and unrefined – Ki was disappearing from the training. This inspired Ken to travel to Koichi Tohei’s dojo in Japan in 1980 and 1981 to explore his approach to Ki Aikido. Koichi Tohei had split from the Aikikai (main organisation of Aikido) in the 70s feeling he had no room to explore Ki. There was a major division in the Aikido world. Both streams – Tohei and Aiki-kai – seemed to over-accentuate their differences. The Aiki-Kai de-emphasising Ki, whilst Tohei removed many of the Aikido movements. The middle ground that unified the two approaches was disappearing. Ken began to work on a unifying approach to Aiki, (Aiki means “unification, to blend with every situation”). He found that many Aikido styles had become set, unable to blend with the other’s approach. Ken began to concentrate his efforts on an approach that was holistic, expressing the essence of what Aiki means. On returning from Japan, Ken began training in parks. Quickly, he attracted many people wanting to train with him, including Blackbelts from other disciplines, looking for something deeper in their practice. This is when he opened the Dojo in Angel House in the city in 1980. Returning to Japan, he had a brief training with Seigo Yamaguchi whose work he knew of through the Macrobiotic movement. Yamaguchi had been a student of George Ohsawa who had taken Macrobiotics to the west. After George Ohsawa had met O’Sensei (Morihei Uyeshiba) he sent Seigo Yamaguchi to train with O’Sensei. George Ohsawa and O’Sensei had become firm friends and saw in each other kindred spirits. Whilst O’Sensei developed Aikido in the form of physical moving training, George Ohsawa researched and taught what he called the Unifying Principle which underlied all the traditional Do (tao) of Japanese Arts. Yamaguchi eventually became one of the main teachers in the Aiki-Kai Dojo and was known for his relaxed, supple, flowing and spontaneous approach to Aikido. Ken found due to a similar background in Macrobiotics, he could easily identify with Yamaguchi’s approach. Ken began to integrate all of these approaches to Ki and Aiki over time to get to the original essence of training. In the early to mid-1980s, he hosted the Sydney visits of Yamaguchi’s students including, Yoshinobu Takeda, now a famous world teacher of Aikido. Whilst opening up his Dojo to these teachers Ken could never quite join their organisation for his commitment was to the more holistic and original stream of Shin Sen. It was during these times – early 1980’s – that he met an old western Sennin – Alfred Kaufmann. Sennin means ‘free person’ or ‘awakened being’ (think Yoda in Star Wars); someone who has reached a freedom and level of mastery in their expression. Although Alfred had never heard of Macrobiotics, he had lived an incredibly “big life” developing some special abilities. At the time of meeting, Ken had just finished a Ki-Shiatsu treatment and he came through the front door and sat on a chair saying “I am here to guide you.” Ken thought to himself, “Who is this person?”. As Alfred talked, Ken found himself rooted to the chair, the room developed a certain golden ambience and Ken could see that Alfred was much more than he had seemed initially. Alfred spoke of his experience in his meditation where he had come across O’Sensei and that Aiki was the new way for human beings. Alfred had been many things in life, including a University Professor, a world lecturer on the Dead Sea Scrolls, he had been the Founder of Osteopathy in Australia and the Director of the Natural Therapy College, a Priest and the list goes on. He was grounded in reality and had very special qualities and was liked by all. Ken opened up the Dojo and his students to Alfred’s influence. Ken and his wife (Tricia) cooked for him and helped look after him to prolong his stay in this world. Ken could share many stories about Alfred Kaufmann, however suffice to say Alfred had an understanding of Aiki on the mental and spiritual level that exceeded all other Aikido teachers Ken had trained with. In the 1990’s the Dojo moved to Bondi Junction and Paddington. During those years many interesting people came to train in the Dojo. In 1995 Tricia and Ken moved to the Blue Mountains with their family of seven children. Ken developed Aiki while exploring Shizen (Deep Nature) and meditation under the many waterfalls in the area. At that time he also established Shin Sen Dojo Katoomba. In 1996 Tricia and Ken were fortunate to travel to the Dojo of 10th Dan Aikido Master and Zen and Shinto Priest, Michio Hikitsuchi. His Dojo was in the beautiful and spiritual Kumano area of Japan where the mountains meet the ocean. There are many great waterfalls to do Misogi (purification) under! They lived in his Dojo for two weeks training twice daily and doing misogi. During the day Ken also treated Michio Hikitsuchi with the Shiatsu system he had founded called Ki-Shiatsu. Michio Hikitzuchi had cancer at the time. He received Ken’s treatment very positively and commenting that it was the highest treatment he had received. On leaving, Michio Hikitsuchi presented Ken with some special calligraphy which is displayed in the Dojo today. Ken trained with and supported Tom Crum of Aiki Works, author of the Magic of Conflict, great friend of John Denver and co-founder of Winstar Foundation. Ken assisted Tom in his Seminars on conflict resolution the Aiki way. 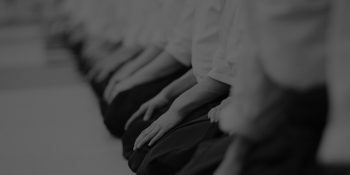 Tom has developed a wonderful way of taking Aikido principles and relating them to every day interaction as well as within the corporate and business world. This is the wonderful thing about Aikido –its principles are effective in everyday life. In the early 90s a group from Shin Sen had a “meeting of minds” with American Aikidoists in Maui, Hawaii. This was led by Aikido teacher and Shinto Priest, Koichi Barrish. He has a very deep comprehension of the spiritual dimension of Aiki as expressed through Ancient Shinto and its application to the modern world. His beautiful and clear calligraphy are on the walls of Shin Sen Dojo. If visiting the USA, visit Koichi Barrish Dojo Shrine in Washington State. In the late 90’s Ken’s wife and mother of seven children passed on. She was a wonderful human being. A great wife and mother, tremendous Macrobiotic Cook and teacher, masterful Aikidoist with the most wonderful forward rolls. At only 5 feet tall, she could easily throw large men around the mat. In the last 18 years Shin Sen Dojo has been settled in the beautiful tatami Dojo at Kensington in the Eastern Suburbs of Sydney. Many new people come to train in the various programmes as well as experienced senior practitioners. Regular visits from senior practitioners and other Aikidoists from the Blue Mountain Dojo such as Darell Shields and Bill Harvey. There are many more names that could be mentioned and will be added to the story of Shin Sen as the dojo continues to unfold. It has been wonderful to have so many people of all ages and backgrounds interact with a spirit of positivity and harmony in the last 38 years. Many people who have trained at Shin Sen Dojo have gone on to found their own Dojos. This includes Peter Hons of Shin Sen Dojo Tamworth in Northern NSW (https://www.shinsendojotamworth.com). Also Geoff Ritchie established Shin Sen Dojo in Levin, New Zealand (https://www.shinsendojo.nz). 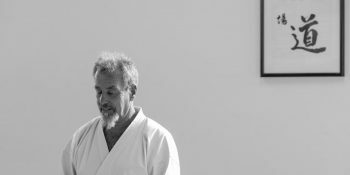 Jamie Terley of Sydney Aikido Dojo in Artarmon Sydney (https://www.sydneyaikidodojo.com). 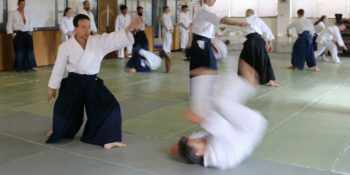 They have all trained for many years in the various arts of Shin Sen and are actively influencing and teaching others in the deeper principles of Aiki on the mat and in daily life. Recently Mike Hanrahan has started Aikido of Shin Sen in the far South Coast of NSW at Tilba. The Blue Mountains Dojo at Katoomba is led by Darrell Shields and Bill Harvey.